Join us for our Summer Beer Fest, with a wide array of beers and some ciders too, which you can enjoy with a pie on the side. 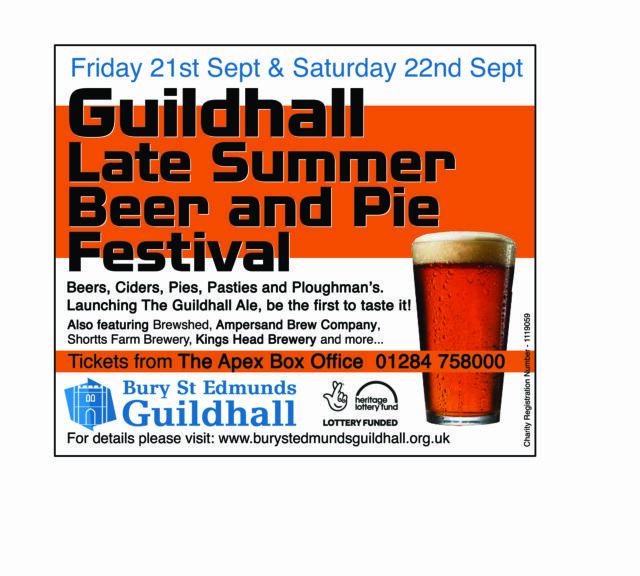 We’ll also be launching our very own bitter, “Guildhall”, brewed especially for us by Brewshed. A session ale brewed to be light, crisp and easy drinking. Citra & El Dorado hops add a great combination of tropical, peach & citrus notes to balance the dry finish and the crisp malt body. A rich stout with big flavours of bitter chocolate tempered by milk sugars. Subtle undertones of dark caramel and coffee give a great depth of flavour and keep the sweetness balanced whilst the large quantity of raw cocoa nibs provide that unmistakable dark chocolate finish. Inspired by modern American IPA’s and is brewed using the distinctive American Citra hops. It has crisp bitterness but is balanced with a rich malt character and a citrus fruit nose. A simple deep pale malt base, with intense tropical fruit. Uses masses of fruity hops to dry hop this beer, creating a powerful fruit character. New best bitter brewed especially for the Guildhall. A traditional best bitter, balanced malt and hops give a rich and fruity taste for a beer of this strength. A satisfying dark mild with dark chocolate and sweet biscuity malt flavours. This IPA, named after the farmland set aside to grow the brewery’s own hops, is a wonderfully hoppy, crisp ale, not lacking in aroma, taste or drinkability. A light and refreshing pale ale of straw colour. This beer is brewed with a simple grain bill, allowing the all English hops to really shine. In keeping with the classic British style, this is an EPA that really suits conditioning in a cask. Rich in colour, body and flavour with a fresh, fruity aroma. Suitable for vegetarians, vegan and coeliac. Gasping Goose is a complex medium cider with a slightly tannic finish. Lilley’s Strawberry is a juicy, fruity cider. A burst of sweet strawberry perfectly complements the refreshing flavour of apples in this moreish cider. Suitable for vegan & coeliac.